This year’s Lilac Festival in Highland Park in Rochester finally opened yesterday (after several days of cancellation because of rain). I decided to do a combined episode of my Yves Rocher’s weeklong test drive and single note exploration “not-a-review” for lilac scents. I love lilacs. As in flowers. This is one of a few things that I miss from my “previous life”. Where I used to live lilacs were blooming all over the city in May. Most flowers in a panicle have just 4 petals so if you were to find a five-lobed flower you would eat it and make a wish. I do not remember either what wishes I used to make or if any of those came true but I can still remember the taste of those flowers. I bet over the years between all my friends we’d eaten more than one bush. It’s almost impossible to come across lilacs where I live now; I saw them two times in flower shops with a price tag… around $40 for a single (and not too spectacular) small branch. I heard of a couple of places within a reasonable drive where I might see lilacs but I haven’t had a chance to check them out yet. I will. As to the perfumes… I keep trying to find one I would like to wear but most of those where I can smell this note as a standing out one don’t play well on my skin. Pur Desir de Lilas – created in 2002 by Annick Menardo, according to Yves Rocher website “Mauve Lilac in full bloom has a green, spicy fragrance, with almond notes”. It is a very uncomplicated but pleasant and light lilac scent. I do not smell almond at any stage of the perfume life but I do not miss it either. I was afraid I would get tired of it but surprisingly it felt fine and I even re-applied it a couple of times during the day. I’m not sure I will be wearing it as a perfume (even though I have a small bottle of it in my collection), but I might follow Grain de Musc’s suggestion to use it as a room spray or try layering it with Bvlgari Black. It’s very inexpensive (currently $12.50 for 60 ml EdT bottle) and still in production. Lilac by ElizabethW – I tried it in a store, sprayed. It’s a very true lilacs rendering. I get from it not only flowers but leaves as well. In my opinion, it’s not the most beautiful but very believable lilac scent. I will probably prefer a linen spray or I might go for a purse spray. French Lilac by Pacifica – first I tried it from a spray at Sephora and didn’t like it. But recently I got to apply it from a roll-on bottle. Unexpectedly I liked it. I might get that roll-on: the scent is nice enough to justify spending $12. Lilacs & Heliotrope by Soivohle – I cannot smell lilac at all! It’s a nice scent but a little too sweet and syrupy for my taste. And no lilacs. Highland Lilac of Rochester – this is a perfume from lilacs in the Rochester Park that I mentioned in the beginning of the story. I loved Highland Lilac the first time I tried it from a sample dab vial. Probably it’s the best lilac perfume on me out of all I’ve tried so far. It smells very much how I remember a bouquet of lilacs smells and I like its drydown on my skin. I will order a small bottle of this perfume soon. I got both Lilac & Heliotrope decant and Highland Lilac sample from Carol at WAFT (Carol, thank you once again!). 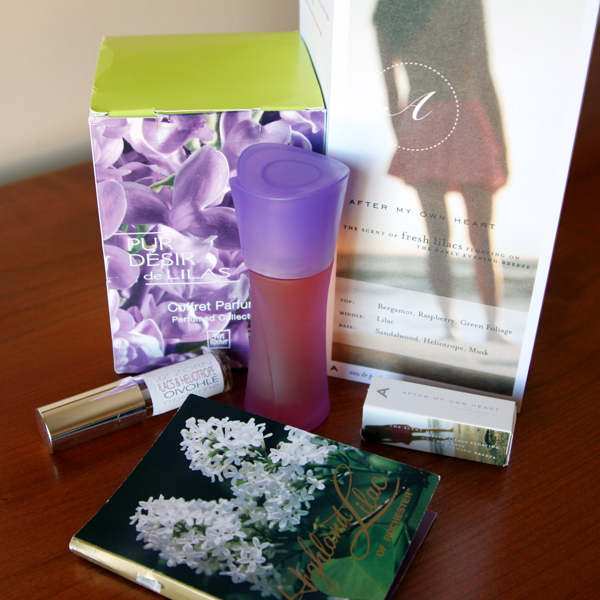 After My Own Heart by Ineke – The perfume opens with a lilac which is too simple and soapy. But in 4-5 hours the remaining scent on the skin is very pleasant. I’d love to jump right to that part avoiding the opening and partially intermediate phases. One day later it smells great on the sleeve. So After My Own Heart is a sweater scent for me. I will use my sample but will not be seeking a full bottle after that. En Passant by Frederic Malle – I want to like this perfume and I cannot. I keep trying it again and again – after all, so many people adore it, – but some note in this perfume just doesn’t play well with my chemistry. The only good thing about it is that I happen not to like the most expensive perfume of all tested. There are other lilac-centric perfumes out there but I will not be actively looking for them (if one finds me on its own I will never refuse it!). I think I do not like soliflores, even with my favorite flowers. I might try layering one of them with other perfumes though. Today I smelled green tea (a real one, as I was making it) over French Lilac by Pacifica on my wrist and I liked the combination. Many other blogs had posts dedicated to lilac perfumes: Perfume Shrine, This Blog Really Stinks, Muse in Wooden Shoes. As always, feel free to post a link to your blog’s post(s) related to the topic. This entry was posted in Not a Review, Single Note Exploration, Weeklong Test Drive and tagged Annick Menardo, ElizabethW, En Passant, Frederic Malle, French Lilac by Pacifica, Highland Lilac of Rochester, Ineke, lilac, Lilac by ElizabethW, Lilacs & Heliotrope, Pacifica, Pur Desir de Lilas, Soivohle, Yves Rocher. Bookmark the permalink. Thanks so much for this – I have two lilac samples – Ineke and Rochester and you have nudged me to try them out this weekend! I’m curious which one you’ll like more. I noticed that all lilac perfumes I tried smelled better when it was a sunny day. Thank you for this whirlwind tour of lilac perfumes. I find it’s a tough note for perfumers to capture without it smelling like air freshener! So true. Lilac and lily of the valley are abused in so many cheap products. 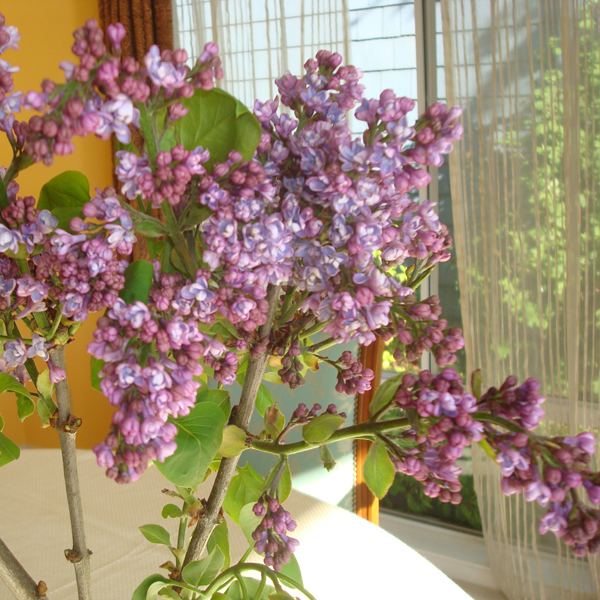 I even started looking into getting a lilac bush for my backyard (not sure though if our climate is appropriate for it) – to be able to smell real flowers if I cannot find a perfect lilac note in the perfumery. I love lilacs too. I’d like to try that Highland Lilac of Rochester sometime. I do like En Passant, but it’s sometimes too cucumbery. Have you tried Diptyque Olene? It’s a jasmine scent but it starts with a big bunch of lilacs. I had a limited exposure to Diptyque. I’ll try Olene the next time I see it somewhere in a store. I have the Pacifica French Lilac and get a new one every spring…the difference between the spray and the roll on is the spray is an edp whereas the roll-on is listed as “perfume”-like you I prefer the roll on. Interesting! I’ve never paid attention to that detail. I bought a roll-on bottle and enjoy wearing it from time to time. It’s probably good time of the year to publish a new post – since this one I’ve tried a couple more of lilac scents since I did this post.